The eye-catching new design of HP Office Paper Pink Ream is at the centre of an ambitious social marketing campaign that International Paper and its partner HP Papers US are bringing to Europe in October. 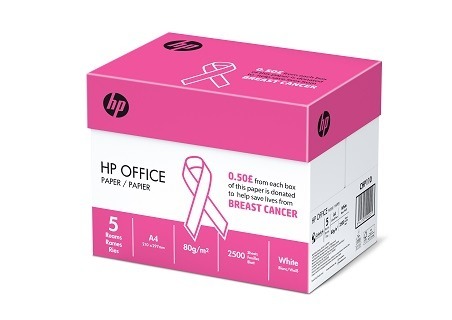 In recognition of Breast Cancer Awareness Month in October, for every pack of HP Office Pink Ream paper sold, International Paper Europe will donate €0.10 (10 pence in the UK) to the Komen European Network (KEN). It is part of Susan G. Komen, the world’s largest non-governmental breast cancer organisation. For 35 years in more than 30 countries it has supported projects focused on education, research, treatment and therapies for fighting breast cancer. KEN operates in six European countries backing numerous initiatives with engagement, ideas, and financial support. In the US the cooperation between International Paper and Susan G. Komen dates to 2007. Since then, the company has donated more than $700,000 to the organisation. The European campaign is based on this long-established partnership. International Paper have agreed to donate at least €100,000 to KEN, with in-house forecasts suggesting that the amount could rise to €150.000. All proceeds from the campaign will be used for KEN projects within Europe, focusing on awareness, education and innovation. Among them is a new, multinational initiative highlighting health and lifestyle. It addresses girls in six countries aged 12 to 18, an age group that has previously been ignored when it comes to the breast cancer awareness. In at least 100 schools per country the girls will learn about the importance of nutrition, physical activity and other aspects of healthy living. They will learn why alcohol, other drugs and smoking are so dangerous, especially in this stage of life. Another project is the Women Health Care Award, which will see €40,000 given to reward innovative ideas and initiatives addressing aspects of breast cancer. These range from monitoring and education to medical and therapeutic treatment as well as new ways to encourage awareness and prevention in corporate culture and public life. International Paper extends its sincere thanks to all distribution partners who are encouraging awareness and engagement for the Pink Ream campaign with communication activities in their countries.